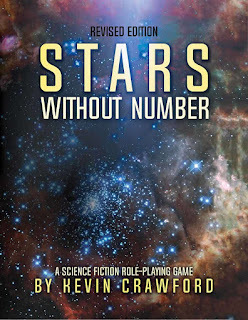 Stars Without Number is probably the best role-playing book I have read in decades. Seriously, it is that good. 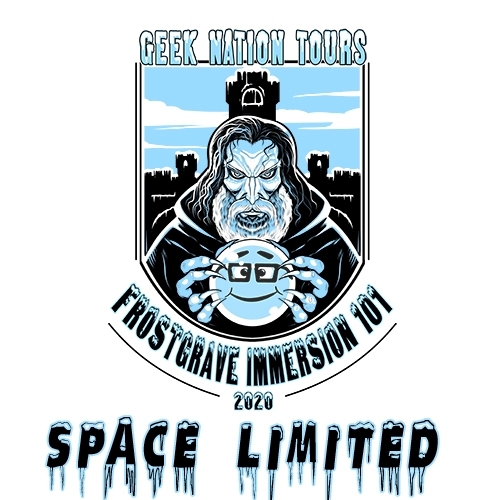 If you are Game Master that likes to create your own worlds, factions, and NPCs, and have any interest in running a science-fiction game, you should really pick it up. Do yourself a favour and get the hardback print edition. I know it is pricey, but this is a book you are going to want to pull off your shelf again and again. Probably my favourite section of the book is the chapter devoted to the various factions that play a major role in the campaign world. These can be planetary governments, mysterious cults, pirate fleets, mercenary organizations, anything. The rules for how they are created, how they function, and how they battle one another (literally and figuratively) is just one of the best pieces of game design I’ve come across. You could (and should!) lift this out to use in any game. In fact, you could easily use it as the meta-game to a wargame campaign. It’s practically worth the price of admission by itself. Heck, the book even has some great rules for running mechs. I had never encountered Kevin Crawford, or his work, before this book. That probably makes me late to the party compared to a lot of people (especially as this is the Revised Edition), but I will definitely be seeking out more of his works. 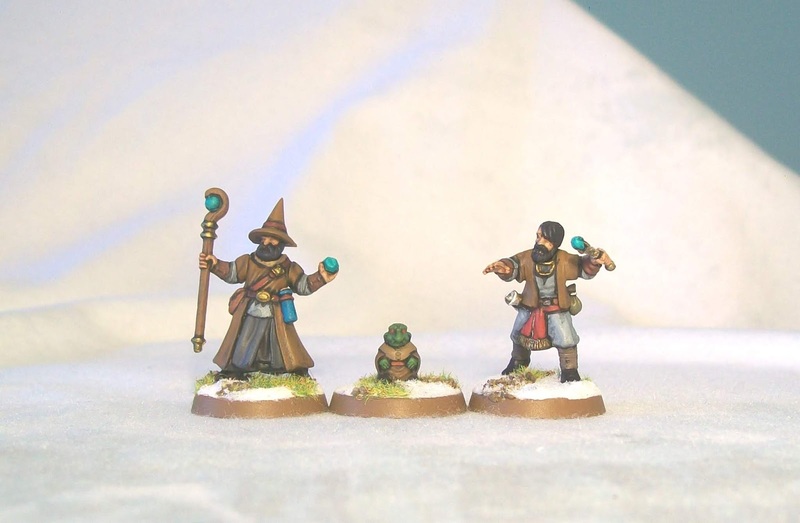 In the latest issue of Spellcaster Magazine, I introduced ‘Legendary Soldiers’ to Frostgrave, which are basically soldiers with special abilities that can be recruited by higher-level wizards. I think my favourite of these is the ‘bookhound’. Looking over my collection, I realized I didn’t have a good figure to represent a bookhound, so I made one. 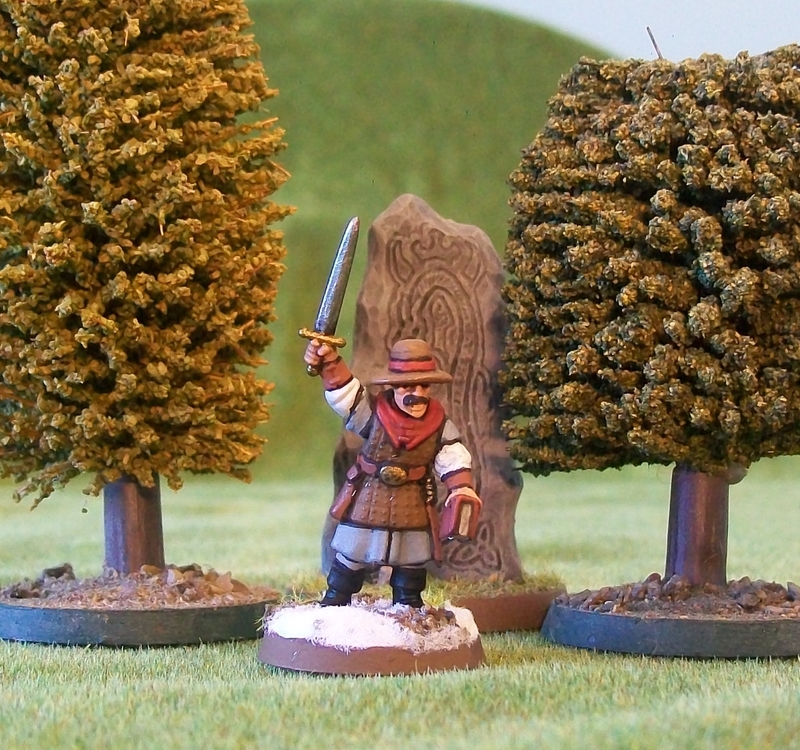 This figure uses an Oathmark body, a Ghost Archipelago Crew head, and arms from the forthcoming Frostgrave wizard set. I wanted a figure holding a book, but who otherwise didn’t look particularly magical. My small brush was starting to go as I painted this figure, so some of my black-lining isn’t quite as sharp as it normally is, but this is only really noticeable in photos, not on the actual figure. Otherwise, I’m really pleased how he turned out. What I especially like about this figure is that I can use him as a thug for when my wizard is low-level, and then convert him to the bookhound should my wizard ever make it a lofty level. While I generally like to focus on painting one figure at a time, I usually have a ‘back-up’ figure on the go as well. This is often some kind of bad guy that I’m less enthusiastic about painting, but want to get done. For example, gnolls. I generally paint these guys while waiting for a wash to dry on my primary figure. Always good to add another gnoll to the horde for Frostgrave or Rangers of Shadow Deep. 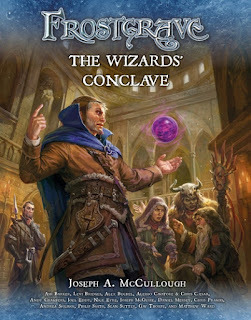 Having posted about what is coming to the world of Frostgrave in 2019, I thought readers might also enjoy hearing about what is in progress for Rangers of Shadow Deep. Now first, I just want to explain that Rangers is a very different beast than Frostgrave in terms of my work schedule. Since Frostgrave is published through Osprey, all of my work is scheduled 1 – 2 years in advance. Thus I have a much firm grasp of what is coming out in a given year. Rangers, purposely, has a much more ‘free form’ publishing schedule, which allows me to write to my own whims and publish when a given work is ready. With that said, here is what I am planning for Rangers of Shadow Deep. Temple of Madness – this expansion has just been sent to the designer, and I am hopeful that the PDF will be available in March, with the print not too long afterward. This supplement is divided into two sections. The first section greatly expands the magic options for Rangers and companions. It increases the number of spells up to 30 and introduces new Heroic Abilities, companions, and equipment that are specific to spellcasting. 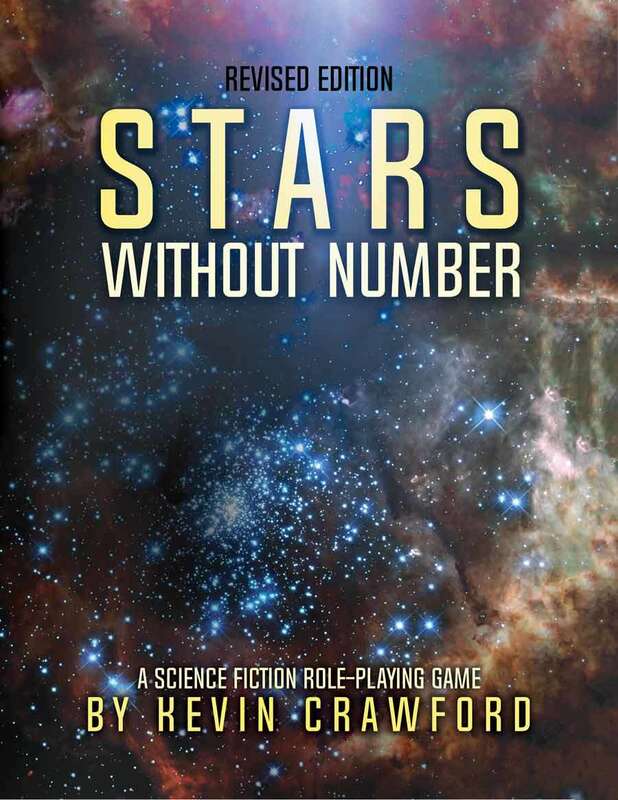 The second half of the book includes a 4-scenario mission. It’s kind of a dungeon crawl, with a little bit of puzzle mechanics thrown in. Temple of Madress is about 15,000 words long, which, by comparison is the length of some of the shorter Frostgrave supplements. That said, Rangers scenarios, especially ones with notes, are much more ‘word intensive’ than the Frostgrave equivalent. Ghost Stone – I have just finished the first draft of this expansion. I’ve turned it over to Barrett to start on the artwork, while I do some playtesting and editing. I have no target date on this yet, but hopefully a couple of months after Temple of Madness. When I started working on Ghost Stone, I thought I was working on a short supplement, akin to Blood Moon, but it ended up growing to about 17,000 words. It is also divided into two main parts. 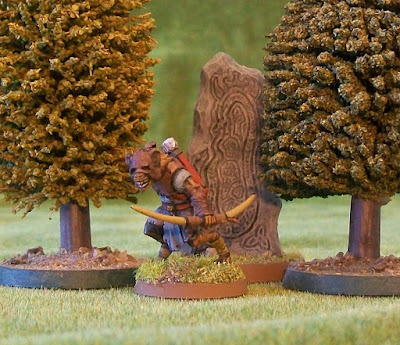 The first part is a 4-scenario mission in which players will need two different Ranger bands, one of starting level, one much more experienced. Each Ranger band will play in 2 scenarios, with all of the scenarios interlinking. Don't worry, this can also still be done solo if that is your preferred method of play. If Temple of Madness is a dungeon crawl, Ghost Stone is more like a war movie. The second half of Ghost Stone is a collection of 52 unique weapons that can be found, each with their own detailed description and potential abilities. Of course, Rangers will be forced to study these weapons in order to unlock their full potential. Menagerie?? – I have just started working on this, and I hope it will be a shorter supplement. The plan is for this to contain a 2-scenario mission and a section that expands the types of animal companions that are available to Rangers. Like I said, I just started on this, and even the title is subject to change. So, that’s where I am with Rangers of Shadow Deep at the moment. Hopefully this gives players something to look forward to. Please remember though, these books are all self-published, and subject to delay from major life events! Also, I will only put the product out if I'm happy with it. I'd rather wait and get it right, than have it out and regret something. Back in Issue 2 of Spellcaster Magazine, I included an article called ‘Frostgrave Mech War’, which used the basic Frostgrave mechanics, but converted them for use with big stompy robots. I even included a scenario. Since then, I have dabbled with the rules off-and-on. I created new weapons systems and a bunch of new mechs. Last night, with my wife out, and the kids in bed, I decided to break everything out and have a play. I devised a quick scenario which had four mechs and two tanks from my Firehawks Legion attacking a small base guarded by a pair of mechs. Those mechs would soon be reinforced by a motorized infantry company. The game started well enough. 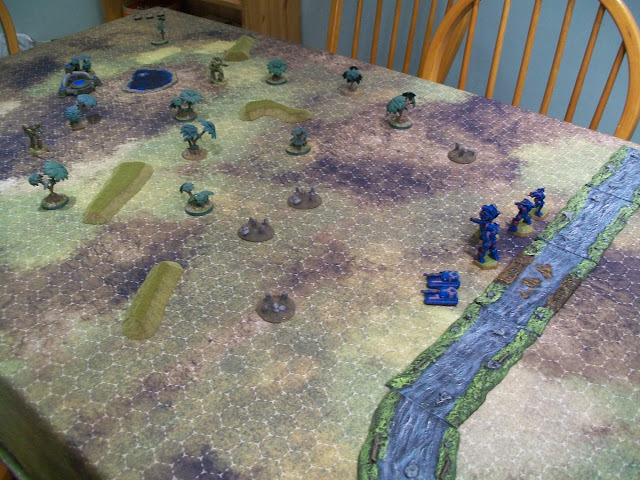 In the initial clash three mechs were destroyed, and the scenario seemed to be playing fine. But… the longer I played, the more I rolled the dice, the more I realized that I didn’t have a good handle on my own rules. I had introduced so many new variables that I no longer intuitively understood the mathematics behind what was happening. Without this understanding, my actions became increasingly random. I ended the game halfway through and paused for thought. I realized that the original scenario I had written was very limited. It only includes two types of mechs with very specific objectives. I had thus been able to balance that scenario through simple trial-and-error. With all the new weapons and mechs I had created, trial-and-error wasn’t going to cut it. As a game designer, I should really understand the probability behind any action I take, if not exactly, then at least generally. Also, I realized that the rules didn’t have the correct feel to me. 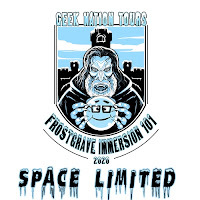 What makes sense for Frostgrave, what felt right in rolling dice in that game, just no longer felt right for a mech game. Thankfully, I was really just working on this game for my own amusement, not for work. So, for the moment, I have decided to just give up on it. I think, if I want to do a mech game, I need to discard most of the Frostgrave mechanics and start from the ground up. That is more time and commitment than I want to give it right now. Oh well, I guess it is back to Battletech. By-the-by, that super awesome hexed game mat is by Cigar Box Battles and is highly recommended. Long-time readers will be well aware of my interest in Greek myths, especially that of Jason and the Argonauts. So, when Stephen Fry released his new book, Heroes, which retells all of the major Hero myths, I just had to take a look. I’ll be honest, I didn’t really expect to like it. Even before I bought it, I had judged it as a ‘celebrity cash-in’. This was unfair, and having now read it, I think it is also completely untrue. The book is a very simple, clear, and adult retelling of all of the well-known Hero myths of Ancient Greece. For the most part, Fry has sifted through the various sources and constructed the best narrative he could find. In a few places the text comes across as irreverent, but then, the myths themselves are often irreverent. There are also a few instances of Fry’s silly humour, but not so many that they dominate the book. The book also contains a good number of footnotes, which Fry uses to discuss points of academia, to mention other sources or other versions of the tale, and occasionally to make a joke or offer a bit of commentary. Having read it from cover-to-cover, I am left with a sense of real ‘honesty’. I think Stephen Fry wrote these tales down exactly as he would have told them over the dinner table, including any asides, quips, and comments he would have made. I didn’t expect to like it, but now I have put the acetate on it, and added it to my permanent library. I will be going back and picking up Fry’s previous work Mythos that serves as the first volume in the series, and will be keeping my eyes open for a hinted, third book which will cover the Trojan War and the journey of Odysseus. 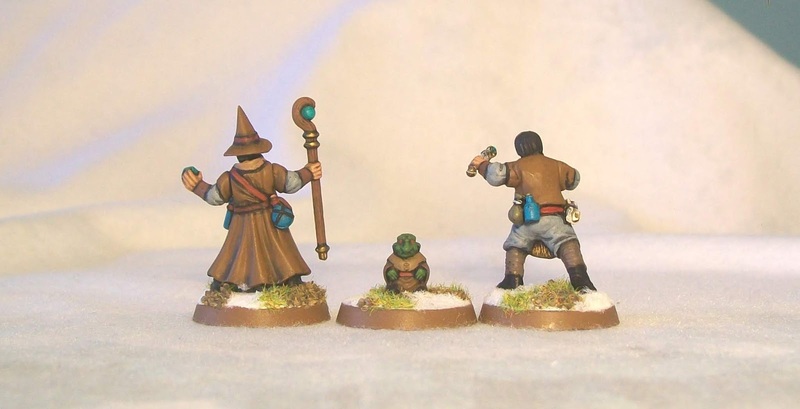 There is a rumour going around that a plastic wizard set is coming to Frostgrave. Well, the rumour is true! I actually received a 'test sprue' a couple of weeks ago. It was just a sample, and there was still some cleaning to do on the mold, but I just couldn’t wait! There are so many fun bits on the sprue, I just had to clip some out and have a play. Here is the result! My new wizard, Nicholas Nicodemus and his apprentice Porthek! Nicholas is made completely out of pieces from the sprue, including one of the four bodies. I gave him a staff in one hand and gem in the other. The gem is obviously some kind of power stone. I also glued on a couple of extra potion bottles, of which there are many on the sprue. For his apprentice, I used a body from the Ghost Archipelago Crew sprue, just to see how compatible they were. The head and the arms come from the wizard sprue. I gave him a magic wand, as I figure you don’t get a staff until you’ve made ‘full wizard’. I also attached a couple a pouch, a potion, and a scroll as well. Oh, and that little familiar/imp thing? He’s on the sprue too! The Wizard Box set is due out March. It will retail for £15 and contains two sprues. Each sprue allows you to make 4 spellcasters with loads of customization options and extra bits! I am finally caught up on the Battletech universe! Which isn’t to imply that I’ve read all, or even nearly all, of its history. Only that I have read the most recent sourcebook that covers the furthest point that the Battletech history has reached (The year 3150). Battletech:Shattered Fortress is another great addition to Battletech’s historical sourcebook line. Like the previous volumes I’ve read, this one gives you loads of information and really makes you feel like you are reading about a complex galaxy, made up of numerous sovereign states, locked in a continual political and military conflict. It is a goldmine of scenario ideas. That said, there are a couple of things I found odd about this book compared to the previous volumes I have read. First, I felt there was a common pattern to how battles were discussed in the book. It seemed that a vast majority started with an overwhelming attack, then an unexpected gain by the defender, only for the attacker to win out in the end. Okay, there are only so many ways a battle can play out, and this certainly wasn't universal, but it almost started to feel like a rhythm to the book. Also, the book ends on a cliff-hanger. Basically, someone is attacking Earth, but the book doesn’t say who. This struck me as a little bit gimmicky, and again didn’t fit with the feel of the rest of the book. On the whole though, those criticisms are minor. 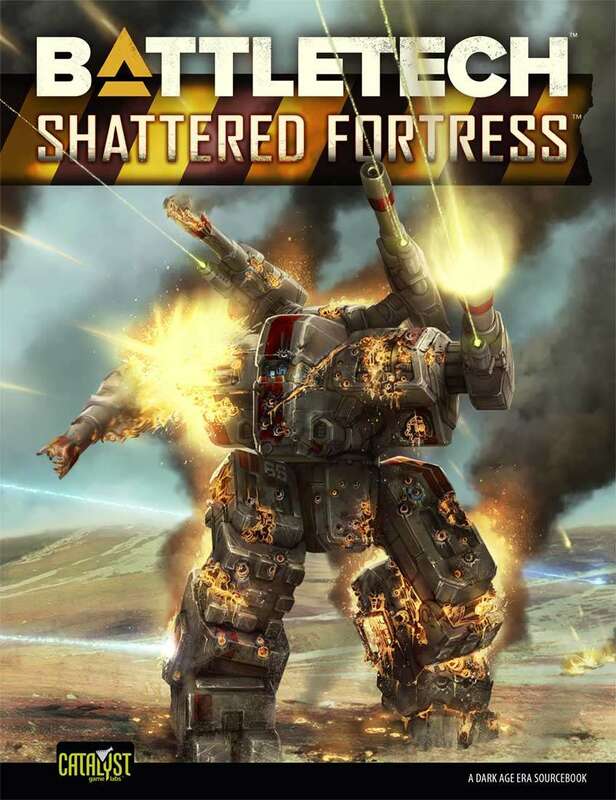 Overall, the book is extremely well-written (in fact the standard of writing in Battletech is noticeably higher than most gaming books on average). 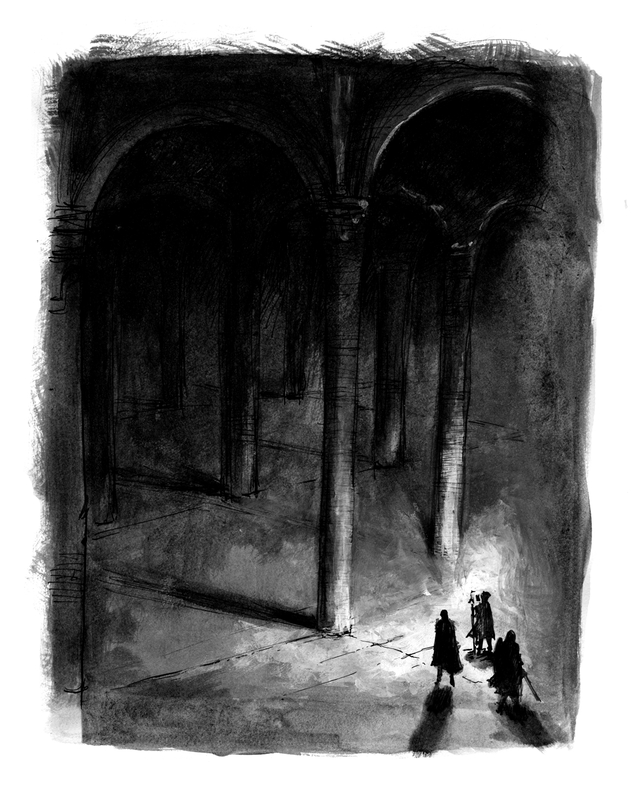 The artwork quality varies throughout the book, but is never terrible, and some of the pieces are excellent. The book contains very little game material (one new mech and some campaigns), but this isn’t what I wanted the book for anyway. In the final analysis, it’s a nice volume that I’m glad to add to add to my collection. I’m glad to see the Battletech universe moving forward again as its ongoing history is what really sets it apart from most other games. If you are new to the setting, there is going to be a lot that is hard to follow, but if you want to get into it, I think the best approach is just to dive right in. 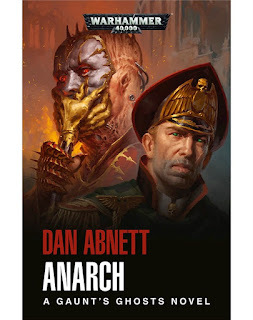 I just finished reading Anarch, the 15th and latest book in the Gaunt’s Ghosts series by Dan Abnett, and it blew me away! Seriously, this book is the payoff for so much that has gone before. While officially it completes a four book arc, many of the plots it covers and brings to a close reach much farther back in the series. This book really takes off about 100 pages in, and from there, the poor Ghosts are sent running in every direction. At one point, there are no less than 4 major incidents going on simultaneously. It is gloriously unrelenting. 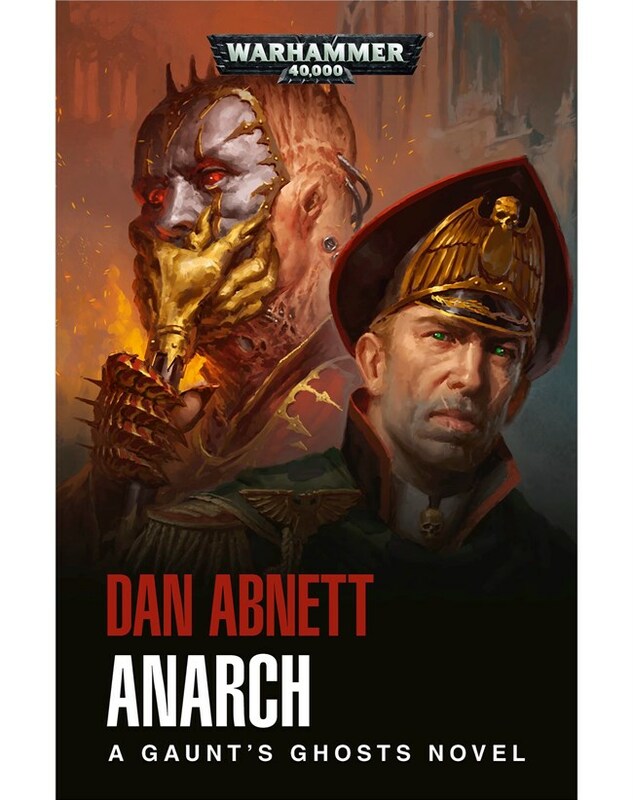 For me, Dan Abnett is at his best when combining military science-fiction with horror, and this book contains perhaps his best example. Heroes rise and fall. Old faces return, while familiar friends are lost. It is, at times, gut-wrenching and tremendously sad, but for every loss there is a gain, and for every villain there is a hero. After being just slightly disappointed in the previous book in the series, Warmaster, this book brings the series right back to its greatest heights. Were it to be the last Gaunt’s Ghosts book written (and I certainly hope that it not the case), I would be satisfied.